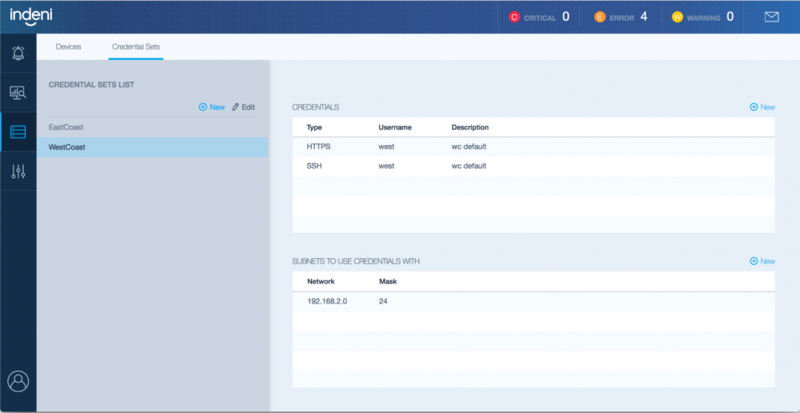 The Indeni 6.0 release is a great leap in the user experience for our customers. It is the result of several years’ work and is based on the learnings we’ve accumulated with customers since we were founded. 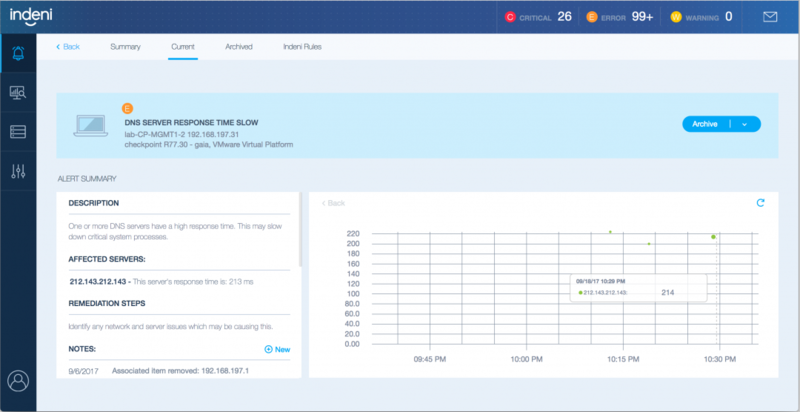 We’ve listened to our customers needs and have built the entire user interface from scratch. Read this blog post to learn more about the design methodologies and give us your feedback by commenting below or joining the Indeni discussion forums. The new user interface leverages the most recent advancements in human-machine interaction and visual appeal. As we all get used to our smartphones and tablets we expect the same level of interaction with the applications we use at work. The 6.0 interface follows that approach to create a streamlined, graphical and attractive interface. 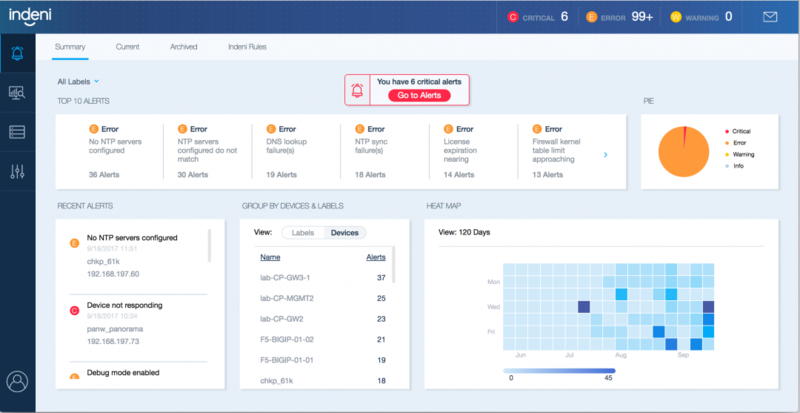 The new Alert Summary view allows you to easily identify issues that are common across your environment, or specific devices and groups of devices that tend to have more issues than others. All of the components in the Alert Summary view are clickable, taking you immediately to the list of alerts to take action upon. You see an alert and determine that you want to change the alert’s behavior? Easily change the alerting threshold, ignore specific items or even disable the alert entirely. In 6.0, all of these actions are available directly from within the alert, and can be easily executed across groups of alerts. As our product adoption increased in large enterprise environments, we see that need for additional customization. In the majority of our customer networks there are hundreds of devices, each with a unique configuration and role to place in their business. With 6.0, you can now modify the alerting threshold for a specific alert (rule) for a group of devices (now called labels). This new feature saves the administrator loads of time. Compliance checks, such as verifying that groups of devices have a specific NTP server configured, now behave just like regular rules. This means that the managing of such configurations has been made easier and benefits from the same improvements that regular rules have received. 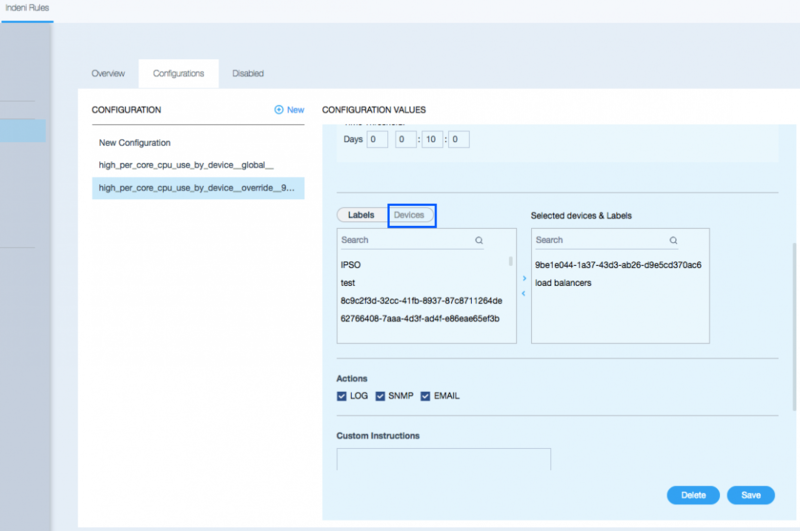 The Credentials tab lets you configure sets of credentials and re-use them for different devices. 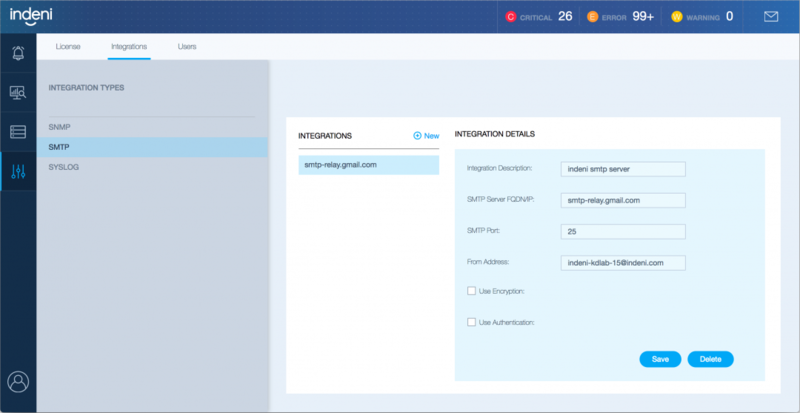 This means you can add hundreds of devices using a specific credential set, and if the password has changed make the change just once in the Indeni user interface. With our new interface, we’ve made relevant device information more readily available – within the alert itself! Each alert includes the device’s model and OS version, as well as graphical information related to the reason the alert was generated. For example, an alert for high memory was issued? You’ll see next to it a graph showing how the memory has looked like over time leading up to the alert. 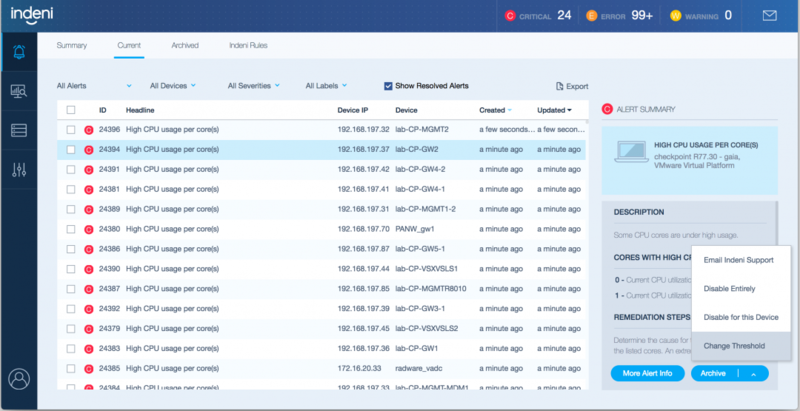 You can now add SNMP, SMTP and Syslog destinations and utilize their hostnames instead of IP addresses. Indeni will use DNS to resolve them. Our previous user interface used Google Web Toolkit (GWT). This is the technology Google originally used with their own applications, but has since declined in its popularity. The current popular technology is React, made available by Facebook and used by thousands of applications. This technology allows for more attractive interfaces, far better response times and capabilities and better cross-browser support. This means better usability, less bugs and new features being released faster. 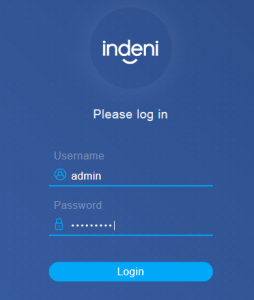 The new user interface, the and use of technologies like React, allow Indeni to drastically improve the quality of the output. Newer technologies, such as Selenium, allow for the automated tests of all of the user interface’s components and functions. This increases the quality of the end product, and reduces the potential for bugs. We have put a lot of work into the new platform and we hope you enjoy using it! Ready to get started? Download Indeni and join the conversation on Indeni Crowd.